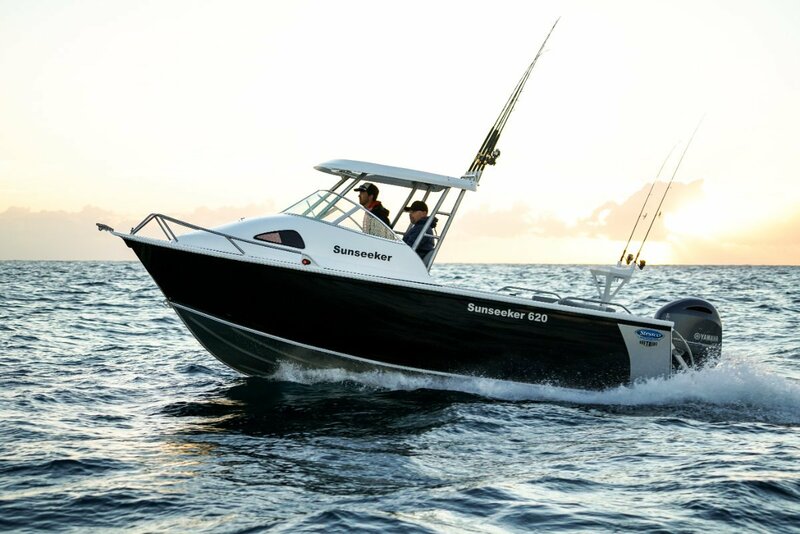 An open hardtop aluminium 20 footer – hull length – with a 130hp four-stroke for $63,000 is pretty attractive. Being pressed rather than plate aluminium has something to do with the price, but it is still attractive. It is not all aluminium though: the cuddy with its attached foredeck and dash is in fibreglass. With the compound curves involved this makes plenty of sense. The only safe access forward is to stand in the fore hatchway; this gives non-stretching access for anchoring and to the cast cruciform berthing bollard. These classy pieces of hardware are also at the quarters. The cuddy has no aft bulkhead, and fitting one would probably cramp the space. As it is the cuddy visually lengthens the cockpit. The settees convert to a double bed with the supplied infill, and this makes up for them being individually on the short side. Removing a panel in here gives access to the technical side of the steering gear and the electrics. This is quickly done, not needing the removal of countless screws as on so many boats. On the driving side of the dash the layout is neat: the simple instrumentation of revs, fuel and speed, the push button Axis stereo, the 27mHz radio and the Garmin 95SV combo are all where they should be. So are the driving seat, wheel and throttle: standing or sitting they work well together. Standing the driver looks over the windscreen; sitting, through it. And all the time is under the hardtop. There is no provision for clears to fill the gap between the two. The common view is that if you are out there in weather that calls for them then you would probably be better off gardening, say. The rear settee is a Stessco speciality: an upholstered storage box, hinged to the deck on its forward edge. In its normal position passengers can sit on it, leaning against padding that continues around the starboard quarter. 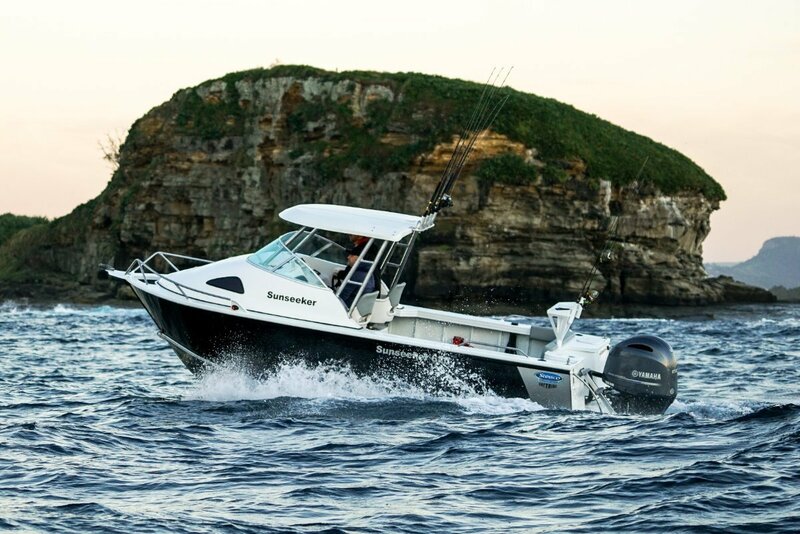 For fishing operations it hinges forward to allow anglers to stand behind it, thighs against the padding. Alternatively they can sit facing aft, although the luxury of the upholstery has gone. The box is not full beam, leaving room for a door to the boarding platform and scuba ladder. Storage in general is well provided for. Besides that large box there are lockers below the settees and the first class seats, two transom lockers, and minor stowage in glove box and side pockets. The fishing fit out will make most people happy. There are rod sockets on the hardtop, in the coaming and in the bait board. This last is a superior item that also does duty as a ski post. For the bait itself there is a plumbed bait tank. A little unusually for a pressed boat, there is also a catch tank. Importantly, the sides are high, hitting the thigh not far below the hip. Better than acceptable stability, too, when putting thighs there. 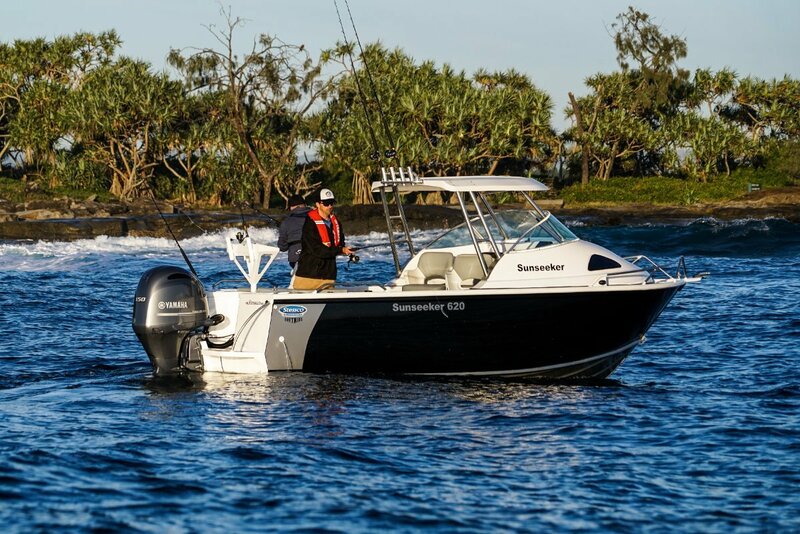 The Yamaha’s 130 horsepower was a good match for what is a fairly light boat for its dimensions – just 750kg hull weight. As usual, instant response to touches on the trim button was a good indicator of healthy power. Driving and manoeuvring were a pleasure; the light but positive throttle-gear shift and the hydraulic steering making the task literally a finger tip job. This is not a new design, and the maker has had time to get the details right: rails are an example. Aft, they were in exactly the right place for hands to drop onto. At the bow they looked low and ornamental but were just right for the anchor man standing in the hatchway. At trip’s end we winched onto a tailor made aluminium trailer, which continued the lightweight theme and offered a long life ahead. On the other hand, these items do not come cheap. If economy is the name of the game, the two to three thousand dollar saving of a galvanized alternative could be important. Just a thought.